Personalized Sport Packs with Mesh and Zippered Pockets, Custom Printed in Bulk or Blank. Promotional, Inexpensive. Budget Prices in USA and Canada. On Sale today! Please see the Price Table below. Fast Delivery. 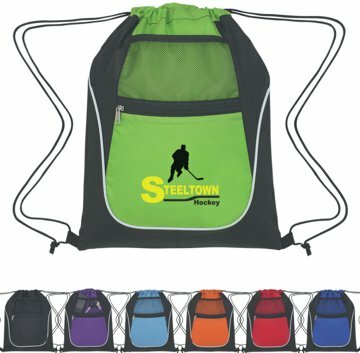 Wholesale Personalized Drawstring Sport Packs made of 210 Denier Nylon and Non-Woven Polypropylene. Our high quality sturdy nylon drawstring bags in bulk are currently on sale: about 30% reduction from the regular price! Fast production: 3-5 days. Budget Prices in the USA and Canada. Free artwork design. We will send you a proof for your approval before production. COLORS: Purple, Carolina Blue, Royal Blue, Lime Green, Red, Orange or Black. Assortment is allowed! IMPRINT COLOR(S): any: you choice; PMS match is free! We also supply not imprinted (blank) wholesale sport packs: see the Price Table. PRODUCT COMPLIANCE: ASTM, Prop 65; Also in accordance to standards set forth by the CPSC. Inspection & certification recognized by A2LA. PRODUCTION TIME FOR IMPRINTED: 3-5 DAYS after artwork approval. Blank backpacks ship next day. 3-5 DAYS after artwork approval. Basic prices are for blank (not imprinted) drawstring bags in bulk or they are for wholesale drawstring bags with 1-color imprint: see the Price Table below. Add the amount shown for each extra imprint color, per side.